Summary: Sam has yet another serious head injury and is in a coma thanks to distracting a ghost to save Dean. 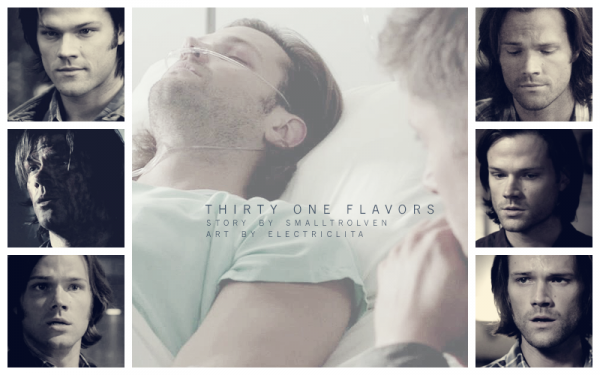 As he recovers, Sam keeps waking up out of the coma as each of the different Sams he’s been over the past few years. Dean is there at his side to talk to each and every one of the Sams, like it or not, all the time wondering how he can ever follow through on the promises he makes to all of them and if he’ll ever get to talk to his Sam again. Author’s Notes: Not my characters, only my words. Written for the 2015 wincestbigbang. Also for the fabulism spot on my spnspiration bingo card. Definition of fabulism - A form of magic realism in which fantastical elements are placed into an everyday setting. We hear from many Sam’s in this story, Soulless-Sam, Hell-Sam, Hallucifer-Sam, Sam who watched as Gadreel took over, Sam who survived Demon!Dean, and Sam-just-plain-Sam. I know there are of course, many other Sams, but these were the ones that wanted to speak up in this story. Thank you to my wonderful beta, amypond45, thanks for helping wrangle all of my Sam’s/Sams into submission. Big thanks to electriclita who made the fabulous art that goes along with the story, thanks for finding all my Sams and incorporating them! It is beautiful, I'm so happy with all of it! Hope you enjoy the re-read and thanks for beta-ing this kind of weird story.